As a breeding male his disposition and respect for people are exceptional. Of his eleven offspring out of our dams, all are a Grand or Reserve Champion (at least once) in either halter, performance or fiber! 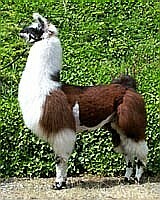 Bolivian Asombroso's Get earned the top honor at the 2005 Grand National Show (click on the "Awards" tab, then click on "2005 halter results" and click on the "Get" link)! Click on the "Our Ads" tab to see the advertisement for Asom and his kids.